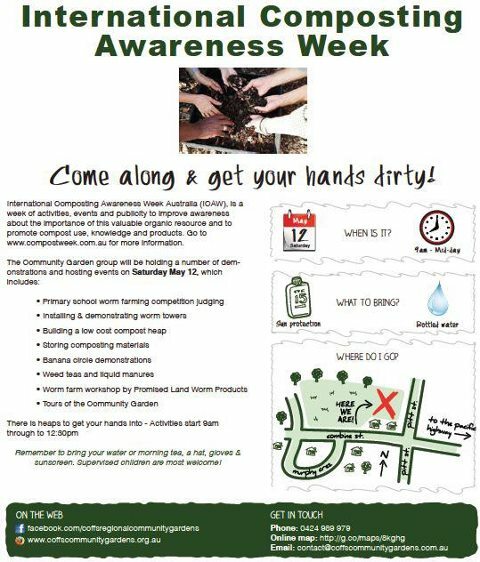 It’s International Composting Awareness Week and we are excited! To celebrate Coffs Community Garden invites you to our first public event on Saturday 12 May 2012 9:00am – 12:30am. During the day we shall hold two great workshops and host a local school competition of some of the most creative designs of worm farms I have ever seen – all made from recycled materials. Arrive at 9:00am to catch the worm-farm workshop hosted by Andrew from Promised Land Worm Products. Take a tour into the world of the greatest recyclers ever known. Andrew really knows his stuff. At 10:00am we will judge the terrific worm-farms that local school kids have designed and built themselves. They have done an unbelievable job – I may just have to take some of their ideas back home to my place. At 11.00am there will be a demonstration of how to build compost systems that just work. No more smelly messy heaps in the backyard. We use this method at the garden and the soil it produces give plants a real kick. Between workshops you can have a complimentary cuppa and cake, tour the garden and check out the other great systems we have started on site. Banana Circles! Worm towers! Liquid manure that turns weeds into plant food! Worm farms in bathtubs and laundry sinks! Print article This entry was posted by CRCG on May 11, 2012 at 5:26 pm, and is filed under Events & Workshops. Follow any responses to this post through RSS 2.0. Responses are currently closed, but you can trackback from your own site.